Only South Sudan, Libya (and Equatorial Guinea?) 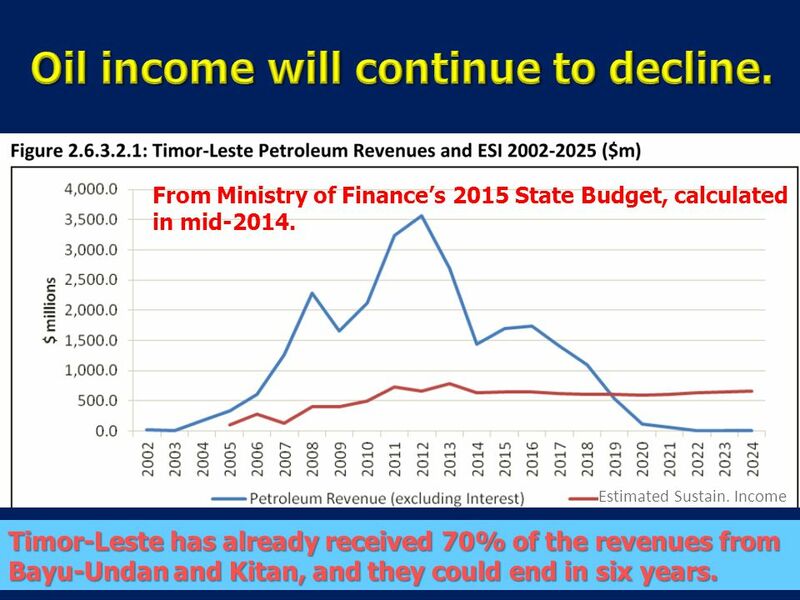 are more dependent on oil and gas exports than Timor-Leste. Petroleum GDP in 2012:…………….… $4,309 million. 2 Only South Sudan, Libya (and Equatorial Guinea?) 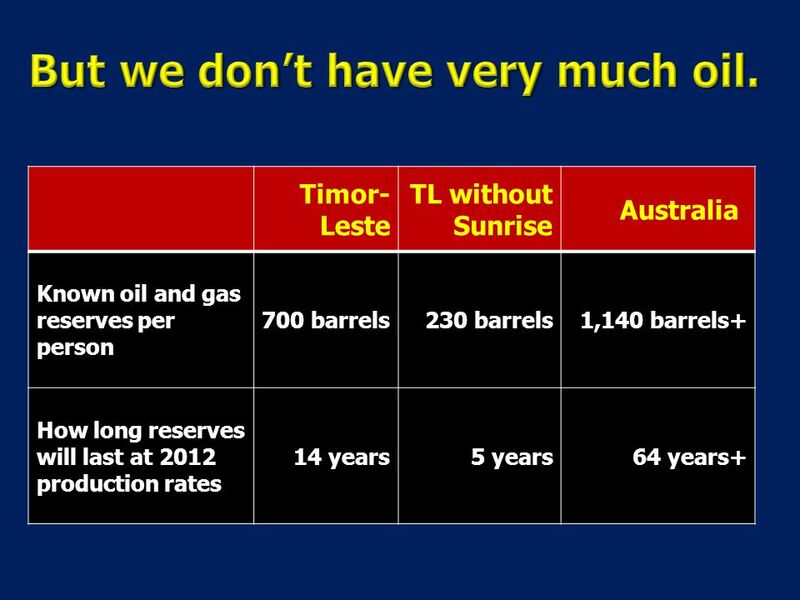 are more dependent on oil and gas exports than Timor-Leste. Petroleum GDP in 2012:…………….… $4,309 million (78%) Non-oil GDP in 2012:..………………… $1,246 million (22%) Productive sectors (agric. & manufacturing) $ 247 million (4%) Projected state revenues in 2015:………..$2,530 million $2,290 million (91%) will be from oil (incl. 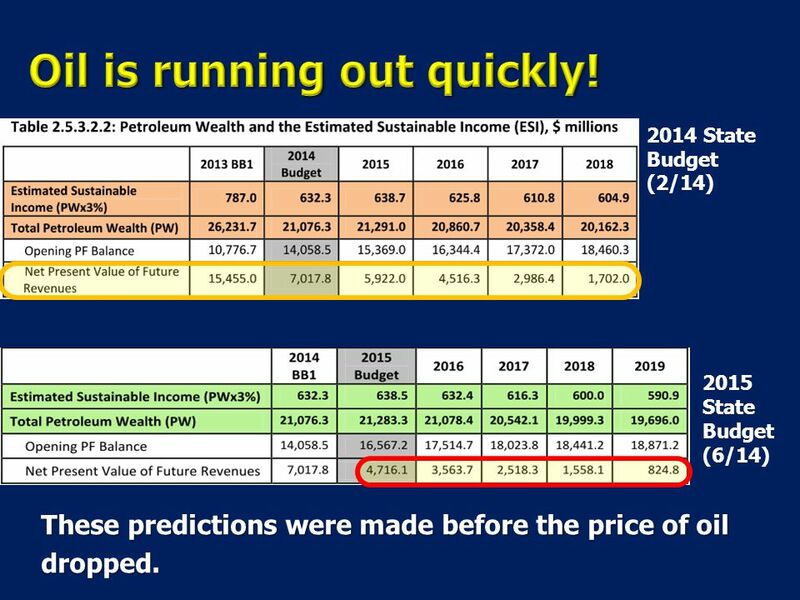 $916m investment return) $ 170 million ( 7%) will be from non-petroleum sources $ 70 million ( 3%) will be from borrowed from international lenders $1,328 million (85%) will come from the Petroleum Fund in 2015. $ 72 million (4%) more is from the Petrol. Fund in the past and future. 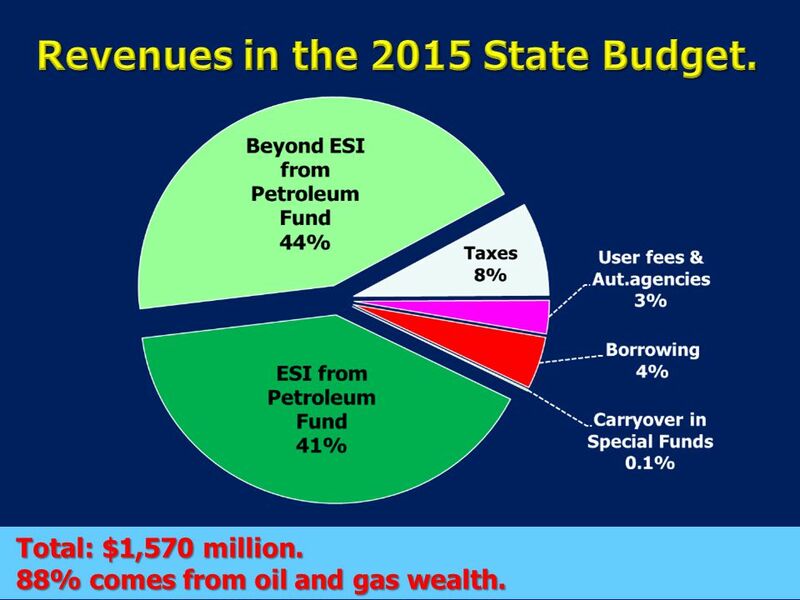 2015 State Budget:……………………………$1,570 million $1,328 million (85%) will come from the Petroleum Fund in 2015. $ 72 million (4%) more is from the Petrol. Fund in the past and future. 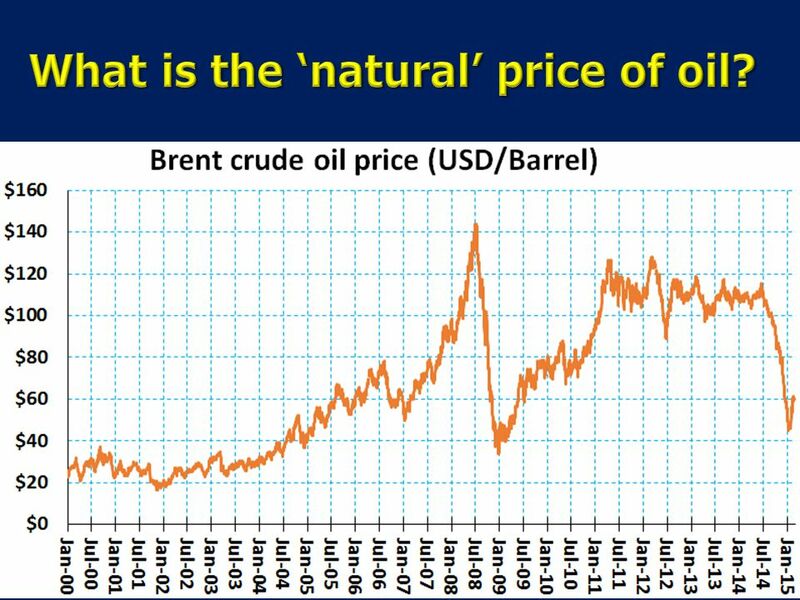 activities, paid for with oil money, are about half of the “non-oil” economy, because some of this money circulates in the local economy. 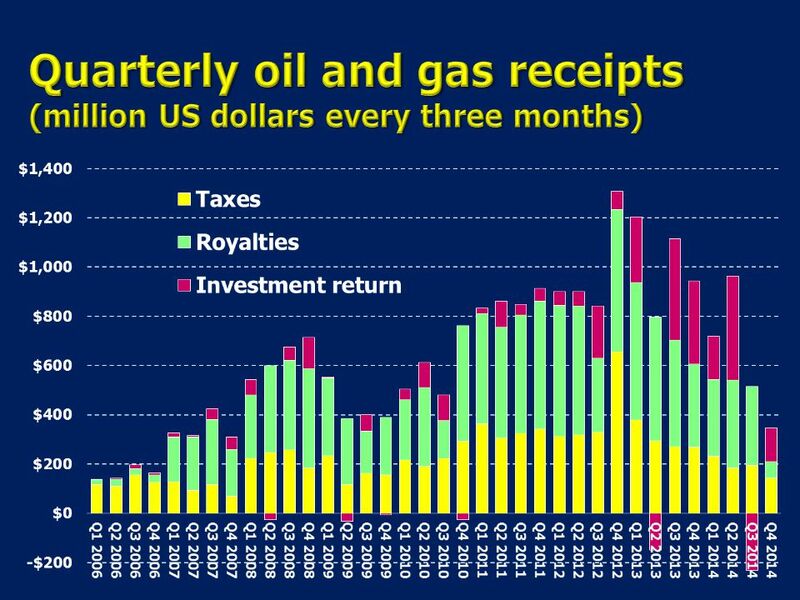 State activities, paid for with oil money, are about half of the “non-oil” economy, because some of this money circulates in the local economy. 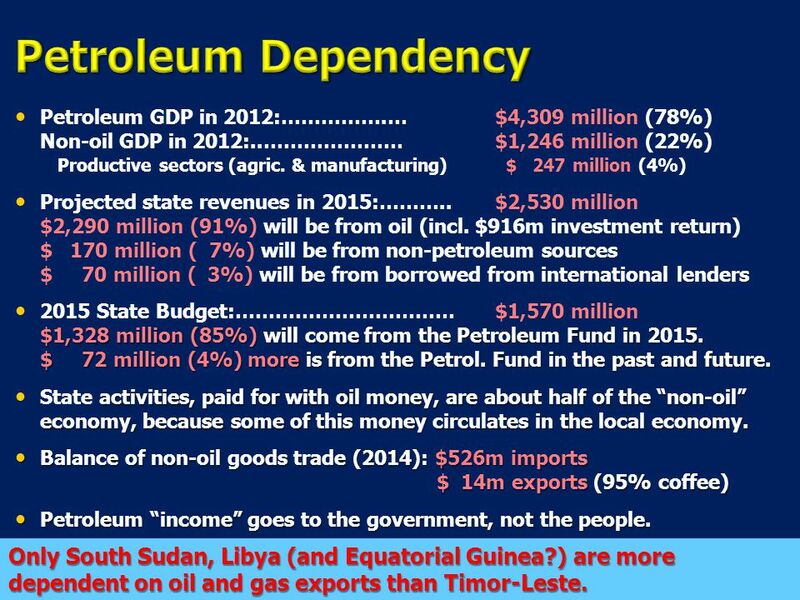 Balance of non-oil goods trade (2014): $526m imports $ 14m exports (95% coffee) Balance of non-oil goods trade (2014): $526m imports $ 14m exports (95% coffee) Petroleum “income” goes to the government, not the people. 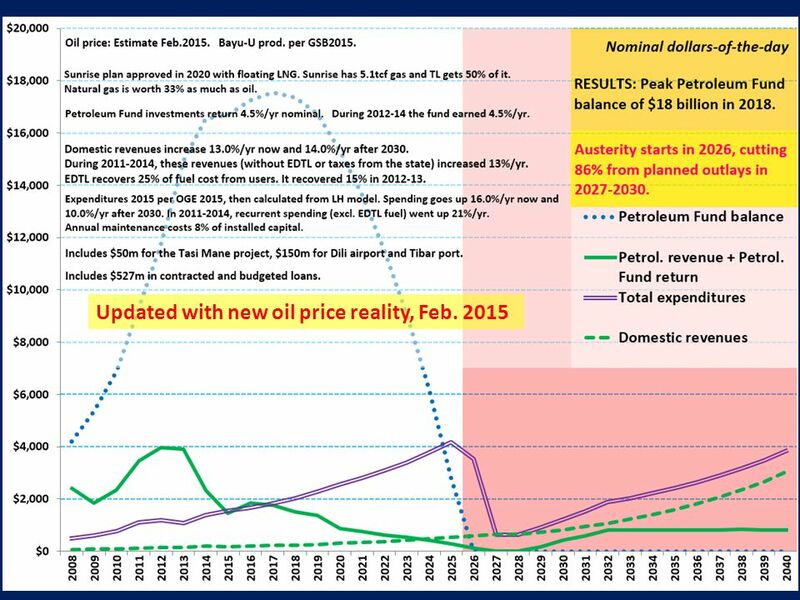 Petroleum “income” goes to the government, not the people. 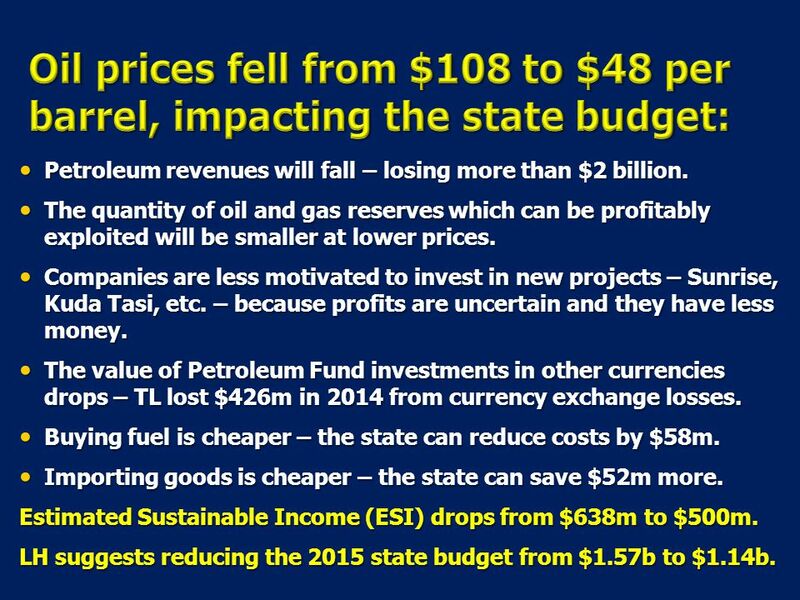 14 Petroleum revenues will fall – losing more than $2 billion. 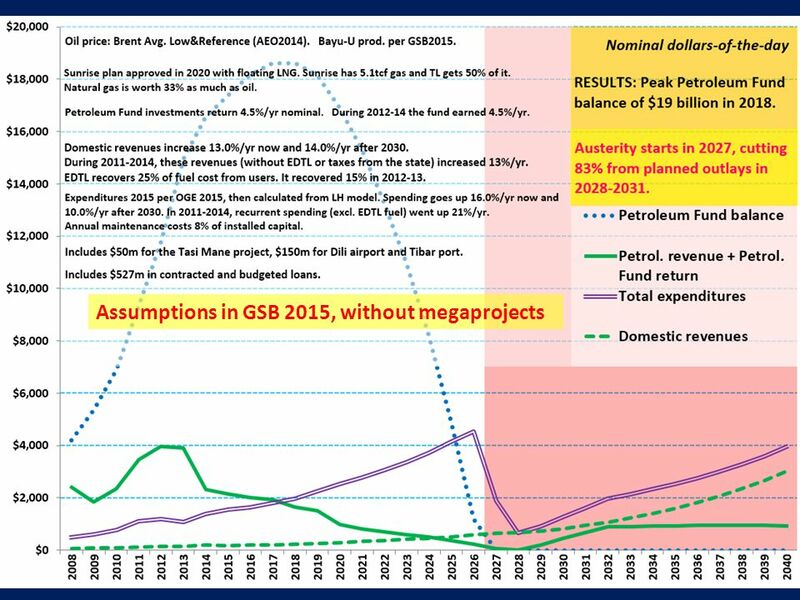 Petroleum revenues will fall – losing more than $2 billion. 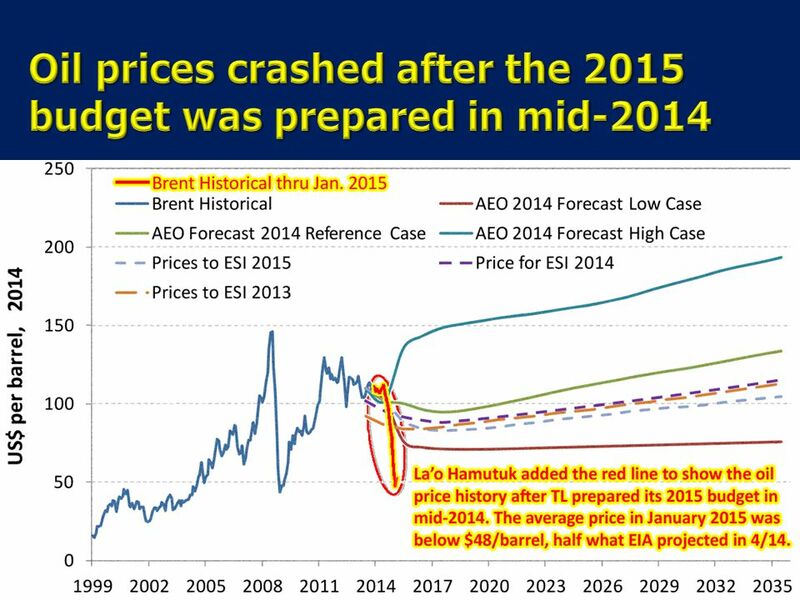 The quantity of oil and gas reserves which can be profitably exploited will be smaller at lower prices. 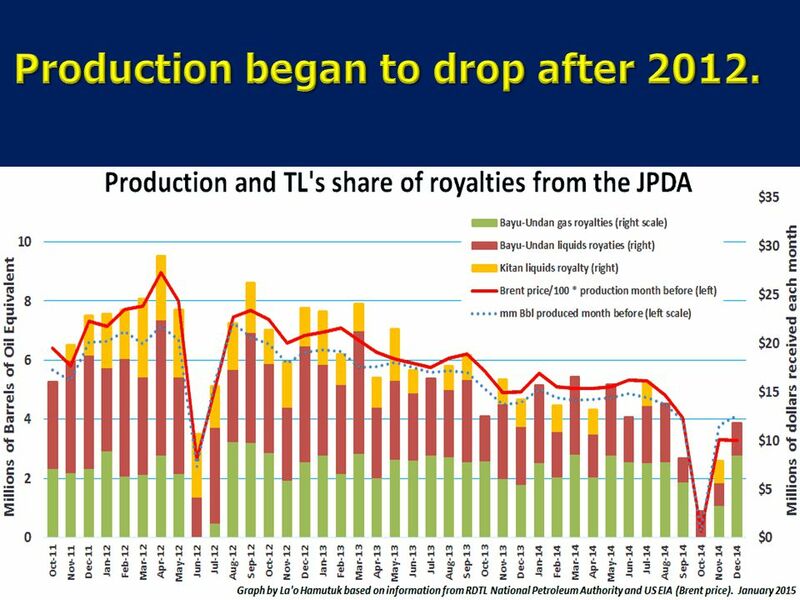 The quantity of oil and gas reserves which can be profitably exploited will be smaller at lower prices. Companies are less motivated to invest in new projects – Sunrise, Kuda Tasi, etc. – because profits are uncertain and they have less money. Companies are less motivated to invest in new projects – Sunrise, Kuda Tasi, etc. – because profits are uncertain and they have less money. 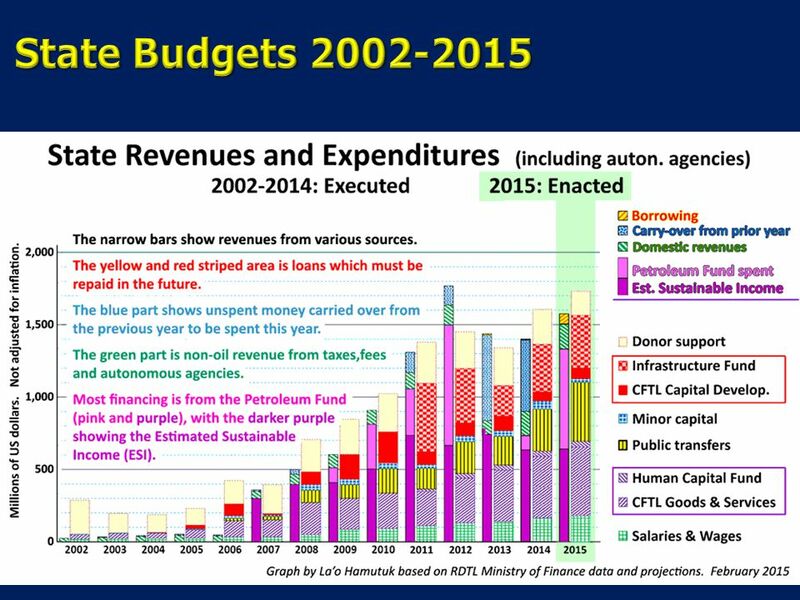 The value of Petroleum Fund investments in other currencies drops – TL lost $426m in 2014 from currency exchange losses. 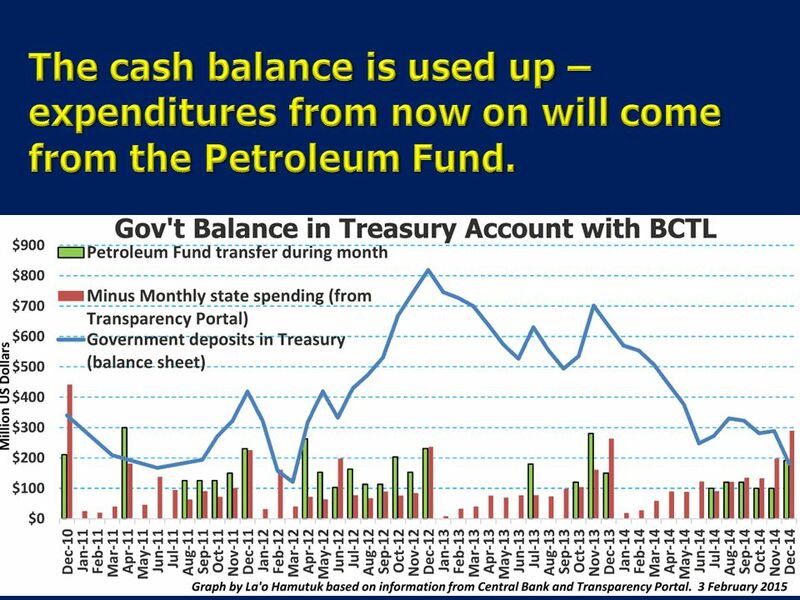 The value of Petroleum Fund investments in other currencies drops – TL lost $426m in 2014 from currency exchange losses. Buying fuel is cheaper – the state can reduce costs by $58m. Buying fuel is cheaper – the state can reduce costs by $58m. Importing goods is cheaper – the state can save $52m more. Importing goods is cheaper – the state can save $52m more. Estimated Sustainable Income (ESI) drops from $638m to $500m. 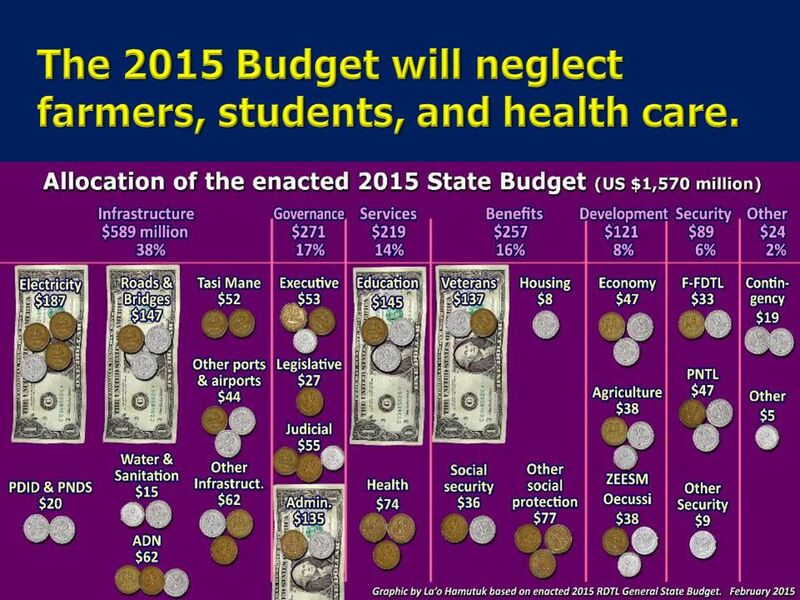 LH suggests reducing the 2015 state budget from $1.57b to $1.14b. 18 Total: $1,570 million. 88% comes from oil and gas wealth. 23 The graph shows legal goods trade only. 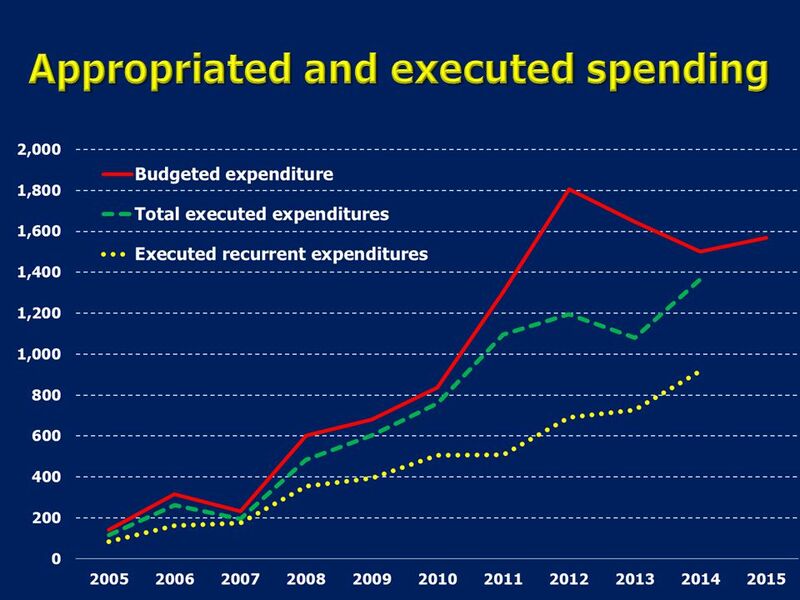 About 89% of donor spending and more than 70% of state spending leaves the country. Download ppt "Only South Sudan, Libya (and Equatorial Guinea?) 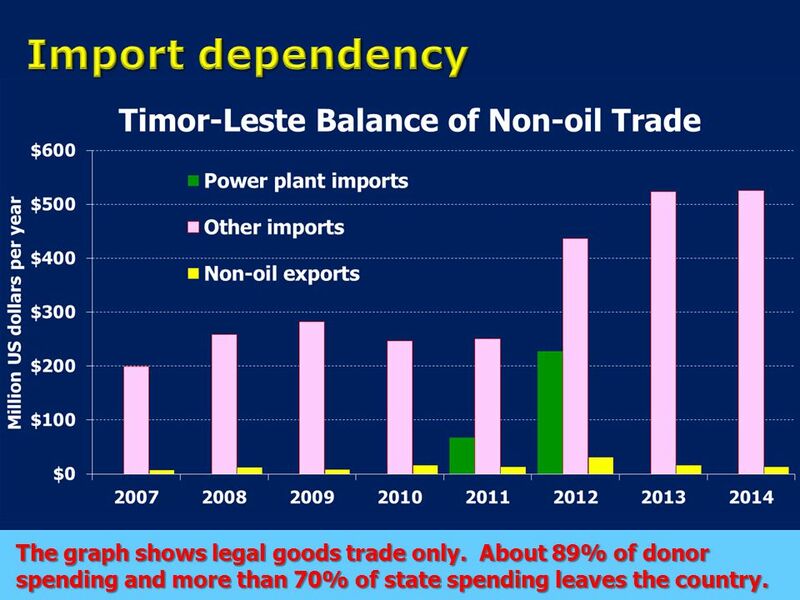 are more dependent on oil and gas exports than Timor-Leste. Petroleum GDP in 2012:…………….… $4,309 million." AD and AS. AGGREGATE DEMAND (AD): The quantity of real GDP demanded (total quantity of G&S that all buyers in an economy want to buy) at different price. 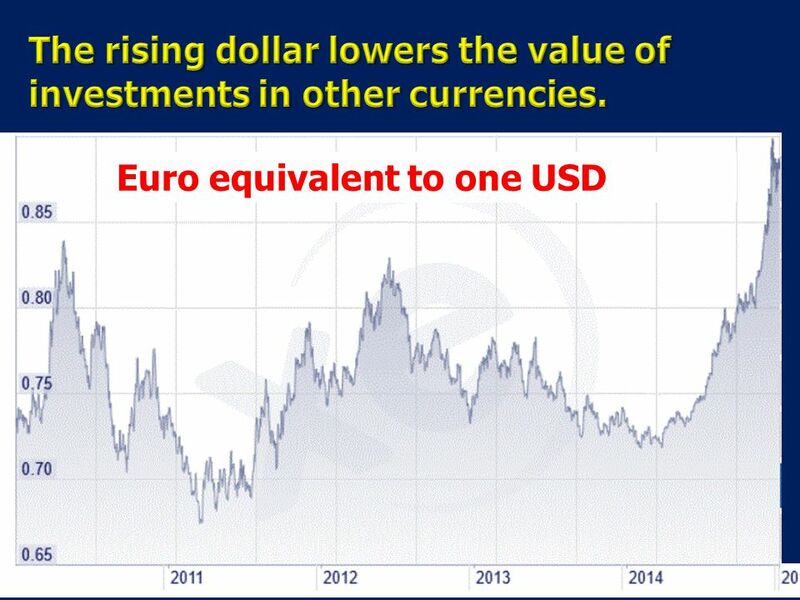 Currencies and Exchange Rates To buy goods and services produced in another country we need money of that country. Foreign bank notes, coins, and. 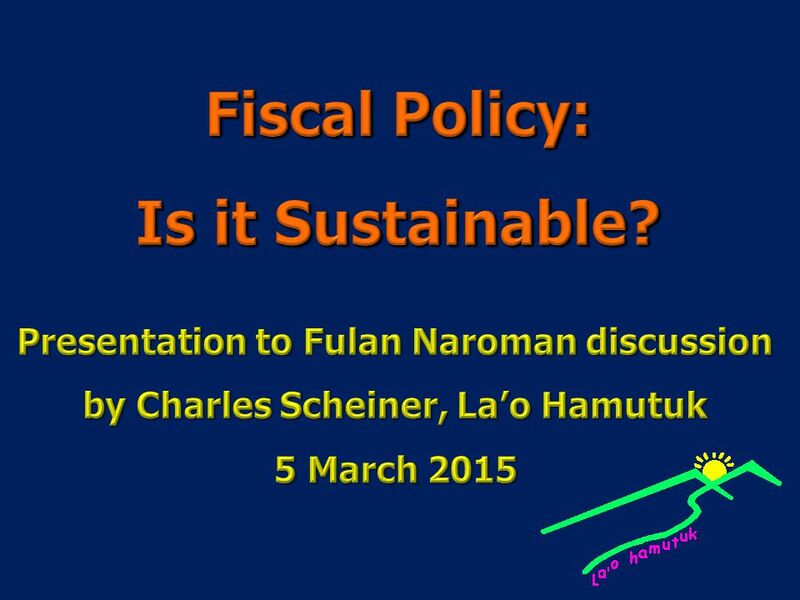 FINANCE AND REAL SECTOR. Graphic 1. Interest Rate : Bank of Indonesia vs Federal Funds Jan '08AprJulOctJan '09AprJulOct Percent Bank. 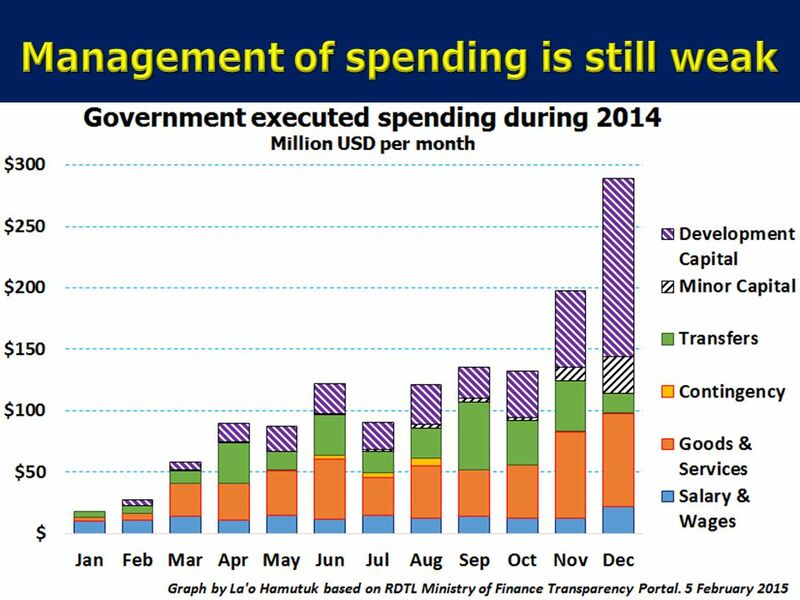 Briefing about Proposed 2014 General State Budget and related topics By Lao Hamutuk Timor-Leste Institute for Development Monitoring and Analysis Rua. 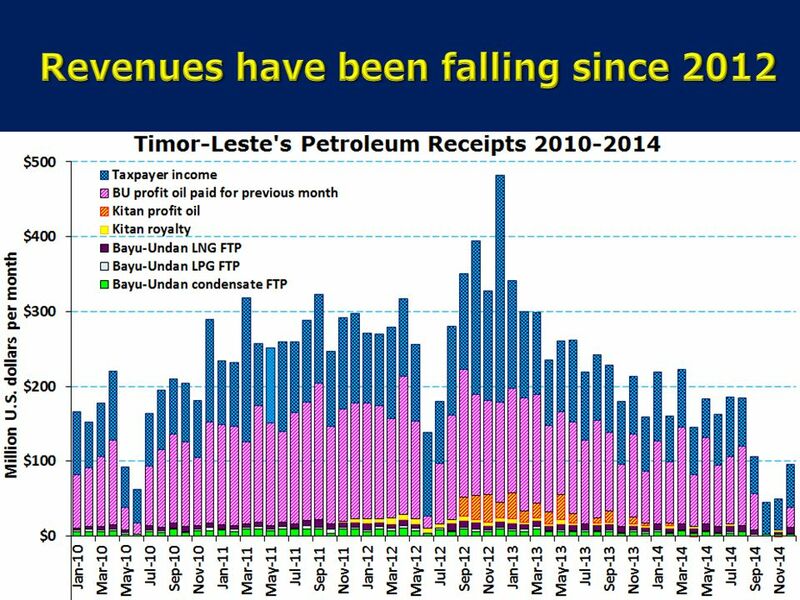 Petroleum dependency in Timor-Leste Petroleum dependency in Timor-Leste Signs of the resource curse Signs of the resource curse Where the Petroleum Fund. The states money? 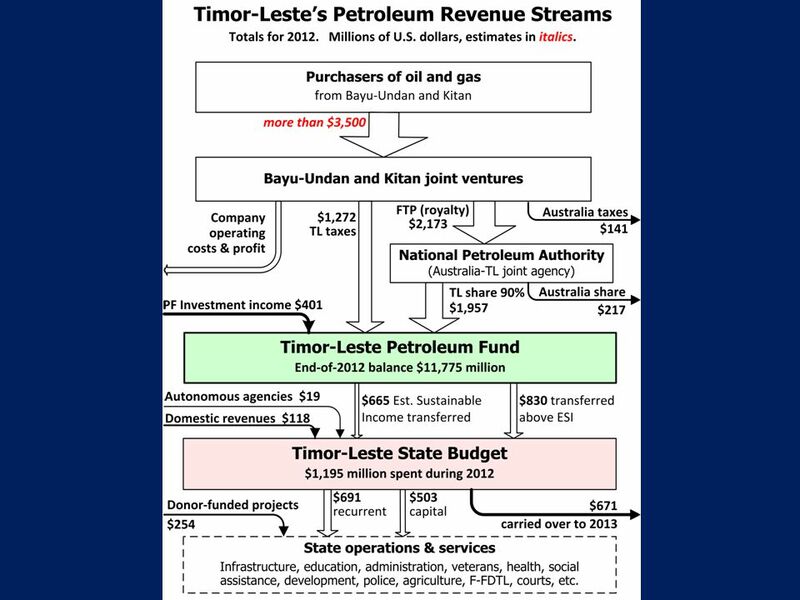 Money to pay for all state programs, including benefits for veterans, comes 95% from oil and gas wealth under the Timor Sea. Timor-Lestes. With current policies, until With current policies, until If were lucky and smarter, until If were lucky and smarter, until With. Timor-Leste restored its independence in 2002, after decades of war and centuries of foreign rule. 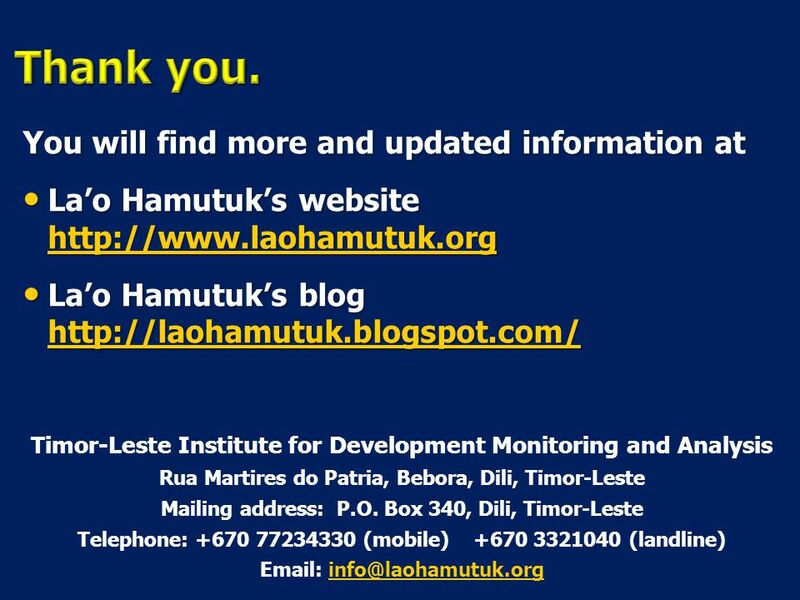 Timor-Leste restored its independence in 2002, after. Ch. 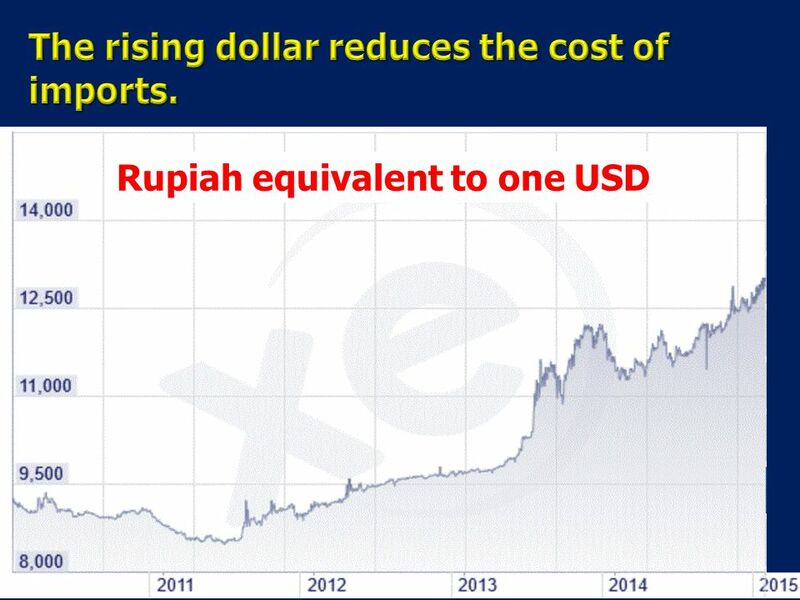 9: The Exchange Rate and the Balance of Payments. ISv Reserve Bank of New Zealand 19 Feb 02 Monetary Policy Experiences and future challenges for a small oil-producing country Presentation at the workshop. 7 FINANCE, SAVING, AND INVESTMENT © 2014 Pearson Addison-Wesley After studying this chapter, you will be able to:  Describe the flow of funds in financial.